Feathered with removable adjustable dividers, this bag can hold up to an DSLR camera and 2 or 3 lenses/flashlights and other accessories in the bottom and storage several pieces of clothes or other things in the top. Keeping your camera accessories organized separated. K&F Concept canvas DSLR camera bag features leather decoration design; richly elegant but wonderfully functional, the bag’s simplicity balances the nostalgia of yesteryear with a modern twist. Material: High density canvas and environment-friendly PU leather; Durable and soft for absorbing shock and vibration, protecting your camera against damages, dust and scratches. It is designed for DSLR cameras like Nikon D500 D5500 D3200 D7200 D7100 D5100 D3100 D5300 D5200 D5300 D3400 D3300 COOLPIX P900 P610 P600 P530 P520 P510 L840 L830 L820 L810 L330 L310, DL24-500 Digital Camera, Canon EOS T6, T6i, T6s, T5, T5i, T4i, SL1, 80D, 70D and more DSLR. It is used for carrying a DSLR and other accessories. A good partner to carry and protect your DSLR for daily photography, and can also work as a transit bag during a long journey. 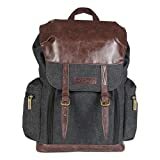 What is K&F Concept Camera Backpack? *Chic design sense from bronze metal buckle and elaborate leather decoration. This entry was posted in Discount Photography and tagged Backpack, Camera, Cameras, Canon, Canvas, Concept, Dark, DSLR, Fujifilm, Grey, Multifunctional, Nikon, Olympus, Panasonic, Pentax, Rucksack, Samsung, Sony, Waterproof by Ball Photo. Bookmark the permalink.